To Canadians, the nickname “Pinball” stands for remarkable athletic talent, outstanding sportsmanship and a commitment to the community. 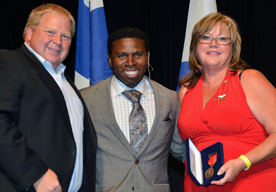 As a former all-star running back, Grey Cup winning coach, president, CEO, and now the vice-chair of the Toronto Argonauts, Michael “Pinball” Clemons is a man of unquestionable character and spirit. He is equally renowned for his achievements both on and off the football field, as he is for his impact as a motivational speaker. Clemons also launched the Michael “Pinball” Clemons Foundation to quicken academic excellence, infuse depth of character, promote health and vitality and inspire philanthropy. The Foundation is committed to building 131 schools for marginalized children in seven under-resourced countries through Free the Children’s Adopt a Village Development Program.